Restaurant equipment can be expensive to purchase. A restaurant owner can usually expect to pay out large sums of money to get new equipment to get a restaurant off the ground or to renovate its kitchen. The tax system is set up to allow restaurant owners to calculate the depreciation for restaurant equipment that they purchase. The restaurant equipment does lose value as soon as it is purchased and used. However, it does not lose all of its value at once. The declining value of this investment over a certain period of time is called depreciation. Calculating restaurant equipment depreciation requires knowing the cost of the equipment, the useful life of the equipment and its salvage value. Why Is Restaurant Equipment Depreciation Useful? Depreciation allows businesses of any kind that purchase equipment or infrastructure, such as a building or warehouse, to spread out the loss of value of the life of the asset rather than having to take the cost as an expense all at once for tax purposes. Restaurants depreciate the cost of the equipment over all the years of its useful life. According to the National Restaurant Association, restaurant operators typically remodel, upgrade or renovate every six to eight years. The National Restaurant Association supports a 15-year depreciation schedule for restaurant equipment. According to the association, restaurant owners are making improvements to their buildings and equipment with increasing frequency. The taxpayer must use the property in business or in an income-producing activity. Property placed in service and disposed of in the same year. Equipment used to build capital improvements. A taxpayer must add otherwise allowable depreciation during the period of construction to the basis of the improvements. Certain term interests, which occurs when you hold a life interest in property or an interest in property for a term of years, after which time the ownership reverts to someone else. As of 2018, the IRS revised the dollar limits of depreciation. The maximum amount you can elect to deduct for improvement property you placed in service in tax years beginning in 2018 is $1 million. You must use the Modified Accelerated Cost Recovery System (MACRS) to depreciate most property. You cannot use MACRS to depreciate property you placed in service before 1987. According to the IRS, restaurant owners can calculate depreciation expense using the 200 percent declining balance method, the 150 percent declining balance method or the straight-line method. The most commonly used methods of calculating depreciation require knowledge of three variables: cost of the equipment, useful life of the equipment and salvage value. The straight-line method lets you deduct the same amount of depreciation each year over the useful life of the property. Once you know the cost and useful life, subtract the salvage value, if any, from the net cost of the item. Salvage value is the amount that the equipment could be sold for at the end of its useful life. The balance is the total depreciation you can take over the useful life of the equipment. Divide the balance by the number of years in the useful life. This gives you the yearly depreciation deduction. The 150 percent depreciation rate is calculated the same way as the straight-line method, except that the rate is 150 percent of the straight-line rate. So, if the straight-line depreciation rate is calculated to be 10 percent, the 150 percent depreciation is found by dividing the straight-line depreciation percentage by 1.5 (150 percent) to find the percentage per year. 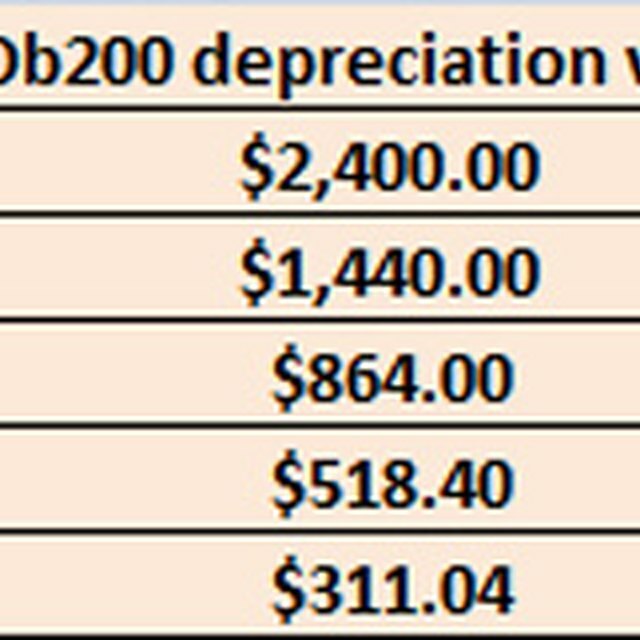 The 200 percent depreciation rate is calculated the same way as the straight-line method, except that the rate is 200 percent of the straight-line rate. Calculate the 200 percent rate in the same way as the 150 percent method except substitute 2.0 (200 percent) instead of 1.5. There are benefits to each method of depreciation and the right one depends on the size of your restaurant and the type and number of assets you use. For small businesses, the straight-line depreciation method is the easiest to use. If your aim is to simplify your accounting calculations, then choose this method. The two declining balance methods often provide a more accurate valuation of the asset. For example, if you buy a new oven, this type of equipment naturally loses more value early in its life than it does later on. If the asset is not losing value in a steady manner, then you might be better served by the 150 percent or 200 percent methods.